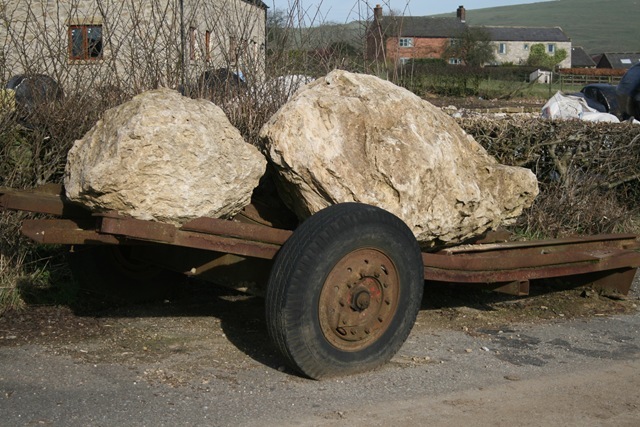 Out on my travels I came upon some lovely rock, the sort of thing you have to go and take a look at and if you have a blog to feed, take photographs of for the ‘post pantry’. with chunks of fluorite, quartz and fossils in them (but not as many as fossils as this blogger found) that I didn’t hear anyone approach. ‘CAN I HELP?’ came a voice from behind me, I turned to be faced by a some what cross looking lady farmer, one hand on hip and the other holding her up her wet hair in a coiled towel; her body language led me to conclude my interest in these fine lumps of rock was not welcome. ‘I was just admiring these lumps of rock, they are beautiful’ phew, I’ve said the right thing, the lady farmer relaxed a little. She went on to explain that they had been excavated by a friend who was making some alterations to some farm buildings, (now if I had lumps of rock this big any where near the foundations of my property I would leave them there, especially as the the geology of the area means that it is riddled with old mine workings and huge natural caverns. We went on to discuss what make a ‘nice’ lump of rock, dry stone walls and parted, despite the initial hostility as friends, by mutual interests. Categories: Away Days, Farming, History, Nature, Photographs, Stone, Thoughts, Travel | Tags: caverns, dry, fluorspa, lead mines, limestone, quartz, Rock | Permalink. I have an interest in rocks as well. Also I have found myself on property, not meaning to of course, just happened to waundered too far, of which the owner inquired of my presence. After I give the owner a business card, and explain I’m just taking pictures for a blog, they normally open up and tell me all sorts of stuff about the things I am taking pictures of. No doubt about it. You’d charm the birds outa the trees! I love rocks as well, find me a gully and I’ll walk it no matter how precarious. 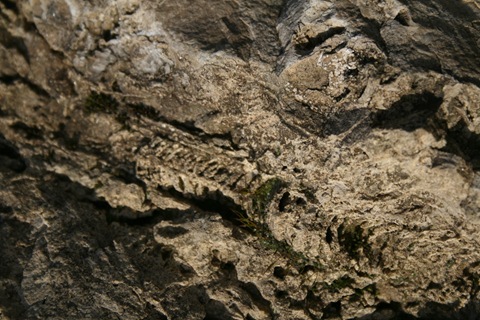 Last fall walking down a gully that had been washed by a 30 year rain we found an entire bird fossilized. It almost looks like a spine of something on that one piece of rock. I got some lovely little blog cards from ‘Moo'(find them on the Flickr web site; you can use as many different photographs as you like and the quality is excellent, people do relax a bit when you explain. I don’t know about charm dickiebo, but I can talk a glass eye to sleep 😉 Talking with the ‘public’ is about the only thing I miss about working in retail. I think your right Nezza, its about the biggest fossil I’ve seen in the ‘wild’ certainly, nothing as impressive as your bird C.
I can’t figure out how to attach photos to comments, so just for you I posted a blog about Petoskey stones on Torch Lake Views. They are nothing as grand as the boulders you found, and nothing so intriguing as the bird, but they are well-loved little fossils!